Remember the days gone past where horse and carriage were the primary mode of transportation? Come see the beauty and elegance of these carriages and their horses. 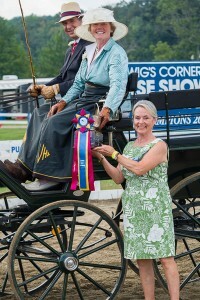 For years, classic carriages have intermittently been a part of the Ludwig’s Corner Horse Show. The Invitational Carriage Exhibit has enjoyed popularity for many years. Eliminating judging removes the competitive edge for contestants and allows the driving to be more fun for the participants. This procedure ensures an interesting spectrum of entries, which is ideal for spectator entertainment. See and enjoy the carriages on Sunday during Labor Day Weekend; these “turnouts” should pass through the Main Ring about 2 PM. A pleasure drive of the surrounding countryside follows. 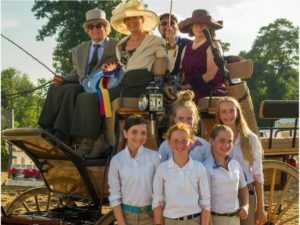 In honor and remembrance of these elegant times, the “Concours d’Elegance” Trophy is awarded to the “best turnout”, which is defined as the most pleasing overall appearance and impression of the horse(s), carriage, harness, driver and passenger(s) together. This trophy has been established and donated by Dr. and Mrs. Rosato. The “Sportsmanship in Carriage Driving” Trophy established and donated by the Dunn Family in memory of Robert M. Dunn is awarded to the team demonstrating the best sportsmanship during the show. To gain information about driving in this event, please call Dr. Donald Rosato at 610-827-7391.